New semester, first critique. 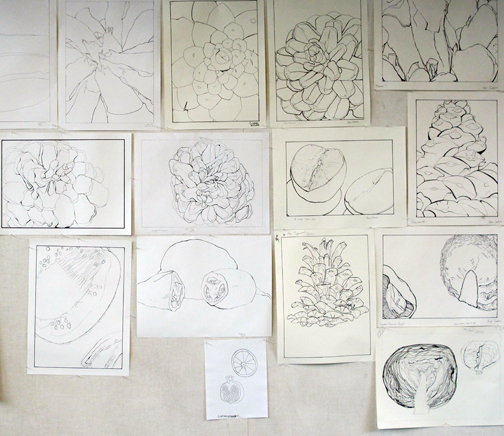 Students put up one wall of very good renderings of a natural object. I quote Jose, a Drawing 1 student, in this post title. He says during critique, The pine-cone doesn’t lie. It always tells the truth. I came back to it over and over and it never changed, it was always the same. I’m the one that changed. I was the one that was lying. I consider calling it a day, so the class can go home and meditate on that one single thought, it’s pretty wonderful. Jose also notes how he had drawn and redrawn, and because he was not at all familiar with a pine-cone, he was forced to look and then look again, and again. He titles one of the studies CSI because, he explains, if his pine-cone was killed or went missing he would recognize its DNA, because of all the intense observation. His last (and 4th study) drawing is below. He only had to complete one, but obviously, he wanted to get it right. Here is a simple (though not so easy) and well observed contour study of his one unique pine-cone. 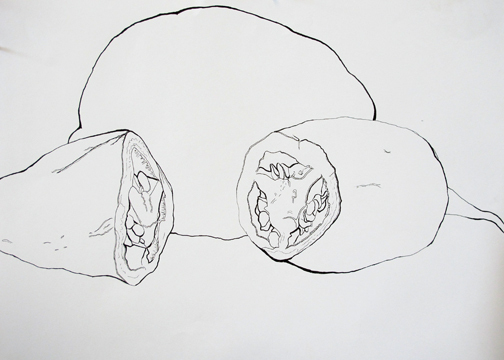 The drawings that follow are all Drawing 1 student’s work. Some of them have never drawn before. And though the assignment is a focus on inner and outer contour, a few do include texture. Clearly, this group is already paying attention. For the record, they work 18″ x 24 and use a Sharpie Marker…no erasing, forcing them to work slowly and really consider what they put down. It’s not effortless, but they sure make it look that way. I know better though. Below are a couple of the Drawing and Composition II students. Crystal (working in oil pastel) and Kim (working with charcoal and conté) have studied with me before. They pick up right where they left off in Drawing 1. As the students are working they talk about the spiral form that they begin to note in their pine-cone. During critique when they are commenting on the accuracy of other student’s work they bring up this spiral pattern again. It helps them identify if what the work we are discussing is real (based on what the student sees) or imaginary (based on the imagination). We really are off to a great start. …and here is an explanation of the Fibonacci Spiral seen in pine-cones…as well as many other things in nature. If I say to you that by the time this last assignment rolls around, the class as a whole, is completely committed to the process, I could be telling you the truth. 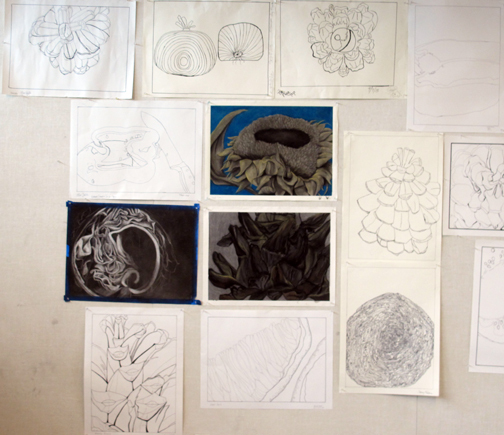 In this final round of assignments I have some students working on still life and others doing a Master reproduction. The assignment includes a variety of subject and various light sources. Value (lights and darks, including shadows) is only part of the challenge in the last charcoal drawing of the semester. They also have to pay close attention to form and surface. They have to distinguish between the various materials in the still life: wood, rope, ceramic, plastic, bone, metal, and glass (both translucent and opaque). Other students reproduce a master work. This assignment is always a great challenge. I continue to remind them it’s not about the result, it’s about the process. And really it is, but when you have a copy of the master work in front of you, it’s hard to keep that in mind. Students come away with a whole new appreciation for whatever skill and technique they copy and learn. It’s exciting to see the work progress. Erica comments after completing her master work, I want to go back and do the charcoal studies all over again. Why? I ask. Because I get it now, It all makes sense! Full circle. Yeda’s frustration… I see so much, there’s no way I can get it all down within this short amount of time! They leave my class with different eyes. They have more seeing ability than they came in with. If you ask me, with this one skill alone, life may never be boring. And one student gave himself fully to this assignment’s process…something he’d resisted all the way through the semester. Why? What’s going on? I ask, not really expecting an answer. The response comes simple and honest… because, I made the decision to do it. Yes, you did. focusing on the negative. it’s a good thing. The Japanese refer to it as Ma which roughly translates as “gap”, “space”, “pause” or “the space between two structural parts. Negative space, in art, is the space around and between the subject(s). The use of negative space is a key element of artistic composition. Emphasis is on negative space in this assignment. Though compositions may appear simple, the concept isn’t always easily grasped. Several students have a more than difficult time with it. I remind them they are learning to look and see in a new way. The brain is rewiring, patience is key. We’ll use the concept throughout the rest of the semester they’ll all have it down, if not now, eventually. Below are examples of some of the drawings we critique today. You decide…do the positive and the negative space balance?